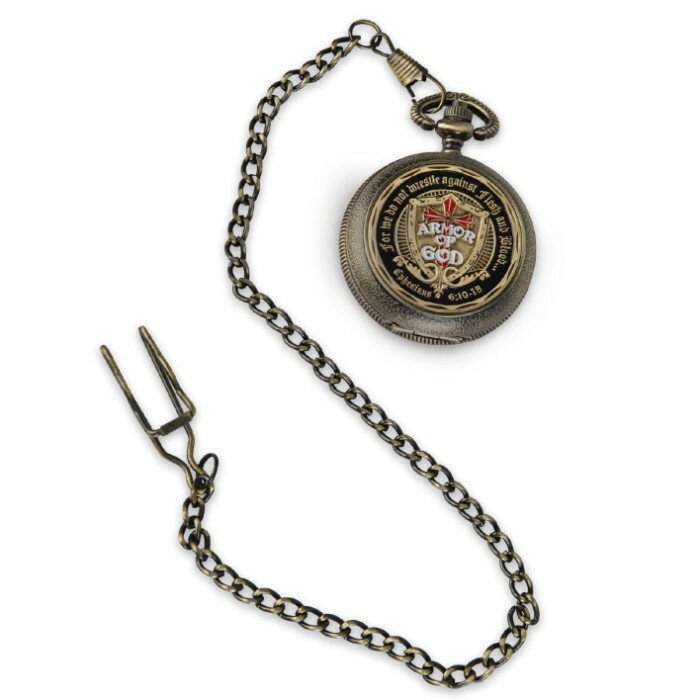 Armor Of God Fear No Evil Pocket Watch With Chain | BUDK.com - Knives & Swords At The Lowest Prices! 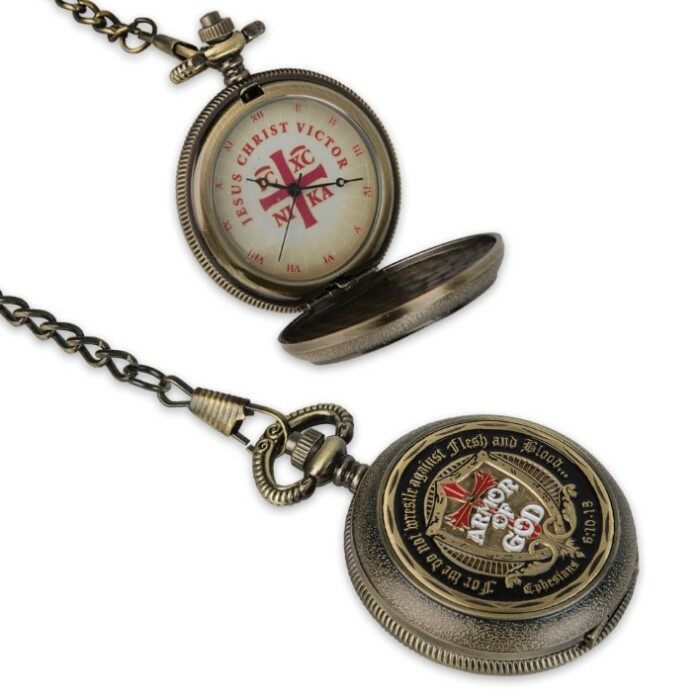 Reach no further for a reminder of your faith and resolve than our brand new, exclusive Fear No Evil Armor of God pocket watch. 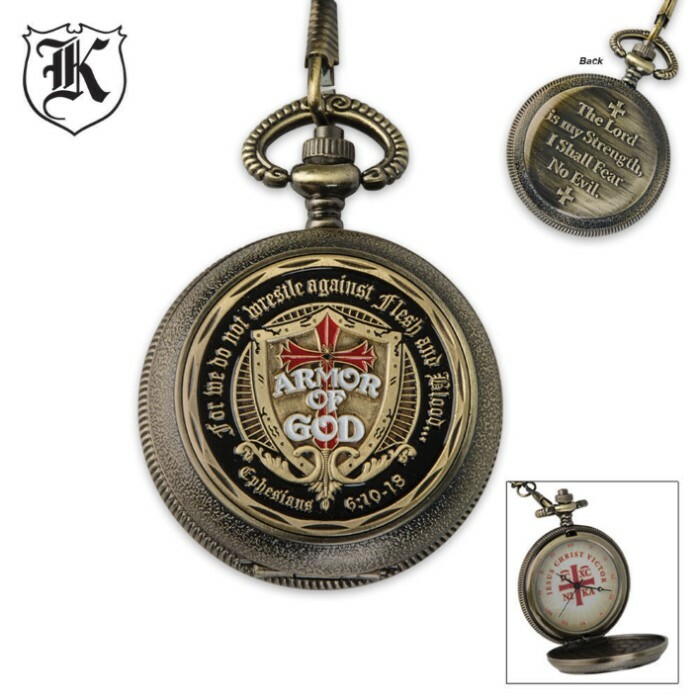 This handsome pocket watch features full-color Armor of God artwork depicting a shield as well as the Biblical reference to Ephesians 6:10-18 on the front. A decorative relief on the back with the words "The Lord is my Strength, I shall Fear No Evil" completes the design. This watch is so nice, I even had an (alleged) atheist compliment it. (of course he didn't bother to read what it said) The craftsmanship is impeccable. And the detail is superb. Though I have found it to be a little slow, it's worth the effort to fix it periodically, because it reminds me of the promise found it Matthew 28:20. That Jesus is always with me. Be careful of the pin that holds the cover on though. Mine came loose, but was easy to fix. Surely appreciate the Jesus caption in the center. Couldn't be disappointed with this watch!Thank you.